How are the reviews on the store’s website? How are the reviews off the store’s website? Is there a Certificate of Analysis with the Kava? Is there a Certificate of Authenticity with the Kava? Is it manufactured in a genuine GMP facility? This is a standard testing result from any lab. Usually called either a “COA” or a “CofA”, this document uses HPLC to test a sample of material. 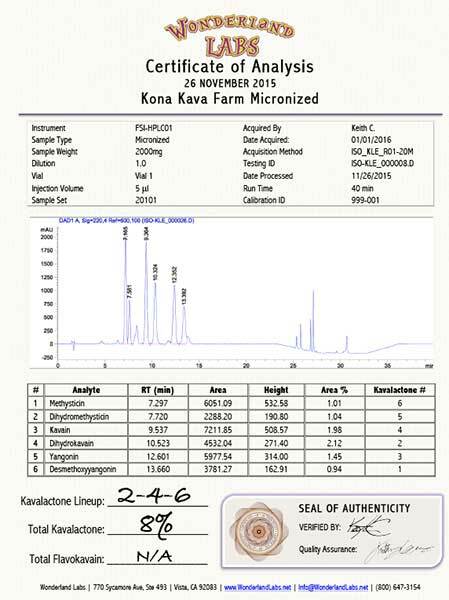 It can, in one simple test, determine the identity, Kavalactone content, and Kavalactone lineup of any genuine Kava. Conversely, if it’s not Kava, this test will reveal whether or not it’s genuine. It will also be able to show whether or not the Kava has been adulterated in any way. Adulteration is a growing concern, especially with Kava that is appearing from China. Wonderland-Labs (Kava testing specialists) have run literally hundreds of tests on various Kava in the marketplace, and are continuously shocked at what is sometimes being passed off as genuine Kava. They reportedly have seen sawdust added to Kava powder in 2 individual cases! Since Kava powder is relatively easy to adulterate, it becomes even more imperative that you can trust the source of your Kava. It’s becoming more and more common for Vanuatu Kava to be sold as Hawaiian Kava, because there is so little Kava in the ground in Hawaii. I have personally been in a market in Fiji, and the Kava there was being sold as Fijian Kava, but right behind the table were sacks of Kava root that I recognized as being from Vanuatu. Now, as long as you’re getting genuine Kava, it’s less important where it’s really from. But knowing that you are getting genuine Kava is the challenge. If there were a way for me to offer a simple way of testing Kava’s identity, I’d gladly post it here. (Any comments about that would be welcomed.) Since there’s no known test as of this writing, it comes down to trusting the company you are purchasing Kava from. To illustrate, let’s use a Case Study of a well-known Kava supplier; Kona Kava Farm. Let’s do a quick case study here with one of the top Kava brands available; Kona Kava Farm. They have been online since the late 1990’s, and their family farm goes back generations. They specialize in “happy” Kava lineups, which are usually a 4-2-6 or a 2-4-6 lineup. Their Mahakea Kava root is known worldwide, and is what put them on the Kava map. While looking through those articles, they talk about how their facility is a GMP manufacturing facility, how all of their raw materials and finished products are not just tested for Kavalactone lineup and Kavalactone content, but the total percentage of Kavalactones, as well as the identity of the material, ensuring that it is indeed genuine Kava. Already, they have gone above and beyond to instill trust in the visitors to their website. Next, we can see if their product is offered on other websites, and indeed it is. If it’s a junky product, or a product that is not genuine, it’s unlikely that other websites besides their own website would want to sell it. A cursory look online shows a number of websites that offer Kona Kava Farm Kava, including eBay, Amazon, and of course, us here at Kava.com. Next, is social media talking about Kona Kava Farm? Indeed they are, and they have a presence on Facebook, with, as of this article, over 17,000 fans! That’s a lot of people who trust that brand of Kava. It’s also why Kona Kava Farm is the premiere brand of Kava in our Kava Marketplace. That’s a lot of data to go on already. Next, something I look for is the variety of Kava or the variety of Kava products that are offered. To me, it only further illustrates the company’s devotion to providing as wide a range of products to as many as possible. Whether you are looking for traditional powdered Kava to make Kava drinks from, they’ve got you covered. If you’re looking for some pain relief and want to stay natural, then they offer Kava Capsules. If you’re looking for a kick in the pants with your Kava experience, then they’ve got Kava Tincture Plus and Kavalactone Paste to fill that need. And, if you don’t like the mess of Kava extractions, they offer Instant Kava as well. So, it’s clear that Kona Kava Farm has been around for a long, long time. They take great pride in their products by ensuring you that 100% of their products are tested for identity and purity by getting all of their products tested at a 3rd party lab (Wonderland Labs). They have some negative reviews, but that’s on a specific Kava forum with their own personal agenda and websites that they’re trying to push. One of the forums loves to bash Kona Kava Farm because they wouldn’t join their forum when threatened with negative reviews. To me, this only further underscores how popular Kona Kava Farm is. And, a quick look on the most reliable place for genuine reviews is Amazon.com. Look through any of the products that Kona Kava Farm has to offer, and you will see that they are super-responsive, that they work hard and fast to resolve any issue, and that in the end, they’re as passionate about providing you with quality Kava as you are. So, what have we learned? Trust your gut. Do your own research and empower yourself. See how long a company has ben around, check out their social media presence, look at the negative reviews and see how they handle them, and don’t be afraid to ask for Certificates of Analysis or Certificates of Authenticity from anyone you purchase Kava from. Anyone who is following the strict regulations set forth by the FDA, will have that information readily available, if not on the website itself when you’re making your purchase. Lastly, make sure wherever you’re buying you Kava has a 100% Satisfaction Guarantee, but with a “no questions asked” policy. Kava isn’t for everyone. It can take time and patience to get past the preparation for powdered Kava, as well as the flavor. You should have the freedom to see if Kava is for you, with the ability to return it without hassle if it’s not. And that’s another benefit of buying from a company who has a number of Kava products: It allows you to try various products, until you find the one that works for you! I tried this stuff and was disappointed. Or maybe I’m immune to the effect, experiencing only a little mouth numbing. I used powdered root that came from your company. If I try again, perhaps soaking the roots and squeezing them via the kit might suffice. There are many things that you can do to get stronger effects, and thoroughly straining your kava is one of the best solutions. You should take your time and squeeze as much liquid out of the muslin bag during the straining process. Although this can be tedious, the last drops are usually the ones with the most kavalactones.